There were moments in Tope Folarin’s ‘Miracle’ where I found myself part of a sweaty crowd in a packed church, as the pastor says ‘let us pray’, the ‘tinny Nigerian gospel music’ rings out, and prayer commences with ‘sweating and shaking and cajoling’. But this apparent mimesis is undermined as the story slowly unravels and we realise how little we know about what’s going on. Though at first ‘Miracle’ seems to tell us exactly what’s going on in that church, soon ‘Miracle’ becomes a story about doubt and not knowing, about truth being uncertain. ‘Miracle’ is the story of a young man who finds himself called up on stage in a Texas church hosting a visiting ‘prophet’, an old, blind man who promises ‘miracles that were previously only possible on the pages of our Bibles’. The narrator is not really a believer himself; this is his first visit to a ‘Nigerian church’, and when the prophet calls him up on stage he doesn’t even have time to ‘wrap up my unbelief and tuck it away’. But as the prophet promises him relief from ‘the spirit of bad sight’, the narrator finds himself tentatively beginning to ‘believe in miracles’, riding the crowd’s spiritual joy and desperation. At the crucial moment, he connives with the prophet to pronounce himself cured, even though he knows he is not. The miracle is a performance – ‘I know what I have to do’, the narrator tells us, as he cries out “I can see!”, squinting through the fog of his unchanged eyesight. But this is an improvised show, constantly teetering on the brink of disaster, with all the actors having to trust each other to play their parts. Folarin’s narrator observes that all sorts of other miracles go on around this staged miracle. The miracles the congregation needs are a product of their diasporic experience in the US: jobs, good grades, green cards, American passports, for their parents to understand that they are Americans and for their children to understand that they are Nigerians (and Aaron Bady writes interestingly about the inclusion of this diasporic story in the Caine Prize). The congregation need the miracle of the narrator’s cured eyesight to be true, so all these other miracles can come true too. ‘Nigerian religiosity’, miracles, pseudo-pastors and gullible believers are becoming a staple of Nigerian and diasporic literature and film, almost as rapidly as fake pastors and credulousness proliferate – see, for instance, Noo Saro-Wiwa on her visit to the Mountain of Fire and Miracles prayer city in Looking for Transwonderland, Patrick Tagbo Oguejiofor’s short story ‘Visa to Heaven’ in the anthology Èkó ò níí Bàjé!, the films His Holiness and His Last Action, or even the videos all over the internet purporting to expose the fakers. Folarin had to work carefully to go beyond just telling us that this or that religious belief is a fraud, that pastors cheat and lie, or that people believe what they want to believe. 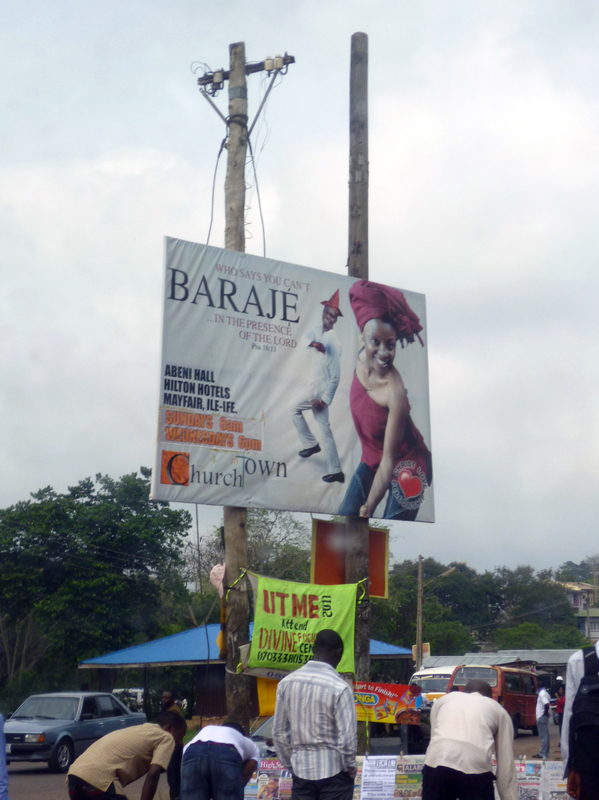 ‘Who says you can’t BARAJE [shake your body, get down] in the presence of the Lord’ – sign from Ile-Ife, Nigeria. And indeed, Folarin’s deft story tries to move the conversation about religion beyond just ‘is it real or not?’, to ask whether any ‘truth’ can be redeemed from that performance in the church. The narrator observes that ‘a community is made up of truths and lies. Both must be cultivated in order for the community to survive’. He finds he has been ‘healed, in a way, even if my eyes were the same as before’. The final and, in fact, only miracle of the story – the narrator’s glasses which restore his sight, just as they do every other day – asks us to put our faith in a very different kind of world view. But we still don’t quite know if the narrator condemns the cowardly failure of the community to prioritise truth over survival and to out the liars, or whether he sees in this compromise something useful and necessary. The narrative itself similarly refuses to divide the world up into this or that; sentence by sentence it tugs the reader to and fro between the past and the future, the old and the new, the familiar and the strange, the young and the old, what has been and what will be. The congregation is always waiting, singing ‘songs of hope, hope that tomorrow will be better than today’. This is a story about the desire for newness. ‘We ask that we will not be the same people at the end of the service as we were at the beginning’ says the pastor, while the crowd need ‘new kidneys, new lungs, new limbs, new hearts’. I agree with Kola Tubosun that ‘Miracle’ isn’t only about religion: it’s about leaps of faith and disappointment, about the parts we all perform without necessarily giving our consent but also without saying no, about being caught up in things and neither sinisterly intending to deceive, nor speaking up against things we know to be wrong. And it’s not much of a leap of the imagination to transpose it to the story of a nation whose politicians promise miracles and deliver almost nothing, and a people who find themselves going along with it in order to make things okay from day to day. The glory of this story, for me, lies in the fog that Folarin builds up around the miracle, echoing the fogginess of his own poor eyesight. While the story is told straightforwardly, it’s also full of ambiguity, an anonymous crowd, a sea of ‘disembodied heads’, confusion and befuddlement, church music which doesn’t make sense for the first few bars, unnamed voices crying out, images – eyes, in particular – floating in and out. While this fogginess is well-suited to a short story, it left me intrigued as to whether the ambiguity and intensity of tone will be sustained in Folarin’s forthcoming novel The Proximity of Distance, from which ‘Miracle’ is an excerpt. My favourite image of the story is that of a thick, ‘cacophonous stew’, which Folarin uses to describe the congregation’s voices, ‘Yoruba and English, shouting and singing, spitting and humming’. The story itself is a similarly thick stew, dense and tightly woven with images and words. If you’d like to participate email Aaron Bady (aaron AT thenewinquiry DOT com) or join the conversation here or on twitter (#caineprize). Thank you! This is a story which certainly draws in the reader. And I love your final drawing of the story into the very stew it names. Hope to ‘meet’ again as the weeks go by. I’m really enjoying being part of this – thanks to Aaron and all the authors and responders.